The flight to Paro offers one of the most spectacular views of all mountain flight. One can see Mt. Everest, Kanchenjunga, Makalu, and the peaks in Bhutan such as Jhomolhari, Jichu Drakey and Tsherim Gang. 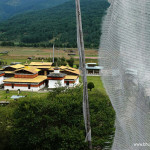 The first gift from Bhutan will be cool, clean fresh air as you step out of the airplane. 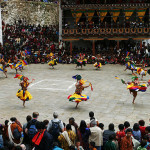 You will be received by our representative and transfer you to Hotel in Paro. Afternoon, After lunch drive to Ta Dzong former Watch Tower which now houses the National Museum and then visit Rinpung Dzong which houses the monastic school and the office of the civil administration and walk down passing close by crossing the Bhutanese typical wooden roofed bridge to Paro town, night will be in the hotel. After early breakfast drive up to the Ramthangka (base camp) of Taktsang and then hike up to the most famous monastery Taktsang, the Tiger’s nest. This magical monastery clings to the vertical granite cliff of 3,000 above the valley floor. It is believed that Guru meditated here in the 8th century. The disciples of Guru built the temple, which was later enlarged by Zhabdrung in the 17th century. After lunch walk back down. Further drive towards the north to visit ruins of Drukgyel Dzong built in 1646 by Zhabdrung Ngawang Namgyel. From there one can see Mt. Jumolhari (mountain of goddesses) overnight at hotel. After breakfast, drive to Punakha – approximately 4-hour drive through picturesque valleys and mountain slopes dotted with typical Bhutanese villages. From the Dochula pass, at over 10,000ft, vast panoramic views of the high snowcapped peaks of the Bhutanese Himalaya can be enjoyed on a clear day. Continue drive down into the Punakha valley. On the way visit ChhimiLhakhang – which was founded in 15 Century by Lama Dukpa Kinley also known as divine mad man. It is half hour walk across a local village and rice field. After lunch visit Punakha Dzong- built in 1637 by Zhabdrung. It is one of the most beautiful Dzong in the country. Later walk around Punakha and Khuruthang town, overnight at hotel. After breakfast, drive to Trongsa via Pele la pass at the altitude of 3,150 meters, a wonderful opportunity for photographs. visit Ta Dzong, converted into the museum from watchtower that once guarded Trongsa Dzong from internal rebellion, stands in Bhutan’s history. Night will be halt in the hotel. First day of festival begins. Witness the festival. 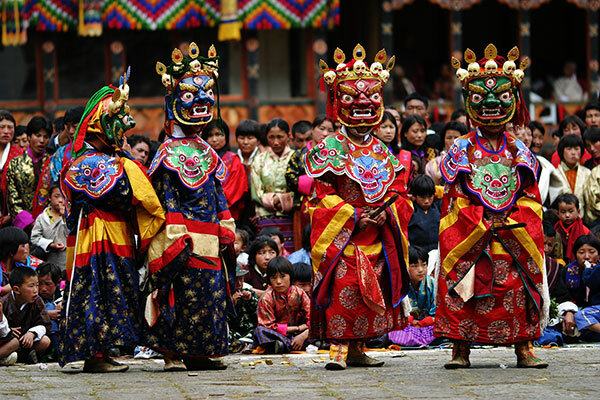 Witness the Trongsa Tshechu on the courtyard of the Dzong. After early breakfast drive to Phobjikha Valley. 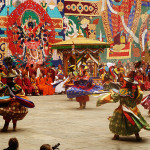 Visit Gangtey Gompa (monastery) which now houses one of the only Nyingmapa monasteries in Bhutan. After lunch walk around the valley which is also the winter home to the rare black-necked cranes, which migrate, from remote parts of Tibet, China and Siberia during winter to this valley. Night will be halt in the hotel. After early breakfast drive to Thimphu. Overnight at hotel in Thimphu. – Buddha Point/ Kuensel Phodang: It is the largest Buddha statue in the country, from there you can get a good view of the Thimphu valley. – Traditional Medicine Institute : In Bhutan, equal emphasis is given to both allopathic and traditional medicines. The rich herbal medicines made up from medicinal plants are prepared and dispensed here. – National Institute for Zorig Chusum: (the school of Arts and crafts) It is an institute where student undertake a six year course on the 13 traditional arts and crafts of Bhutan. – Folk Heritage Museum: the house replicates a traditional farmhouse and is furnished as it would have been about a century ago.